The kitchen area exemplifies the heart of a family’s social standing. This is the place for the family to gather during festive periods to produce flavourful dishes that symbolize the family’s unique culture. Today, the kitchen has evolved from its basic designation as a place for food preparation to a symbolic showpiece of one’s modern home. Incorporating colours, materials and design, the kitchen immediately portrays a family’s social stature and values. 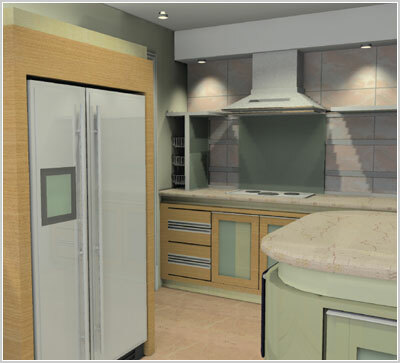 The design of the kitchen is a showcase of personal taste and style. Every step in the design and building of a kitchen, from selection of cookers, hobs and hoods to the doors and door hinges as well as colours, tones and finishes are usually expected to capture the success and pride of one’s stature and livelihood. Sometimes the quality of food can even be secondary to aesthetics. It is important to understand the impact the location of the kitchen has on the overall effect on the home. The first rule one should never break at all costs is to avoid putting the kitchen in the Northwest. The Northwest symbolizes the patriarch, father or head of the household. The Northwest is also ruled by the element of Metal, so when you introduce a kitchen (which represents Fire) into the Northwest, you effectively destroy the luck of the sector and thus of the father. 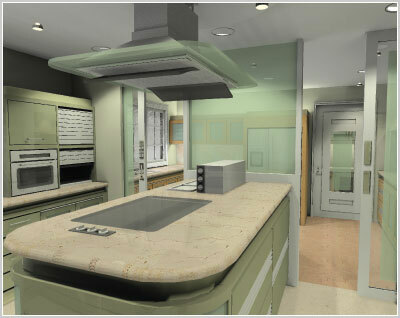 In kitchen design, it is a good idea to create a flow of workspace between the two functions: cooking and preparation. This is where the concept of the dry and wet kitchen comes into play. Typically, the wet or ‘outdoor’ kitchen is where cooking and cleaning is done. it symbolizes the element of Fire. The dry kitchen serves as the preparation zone or display area. 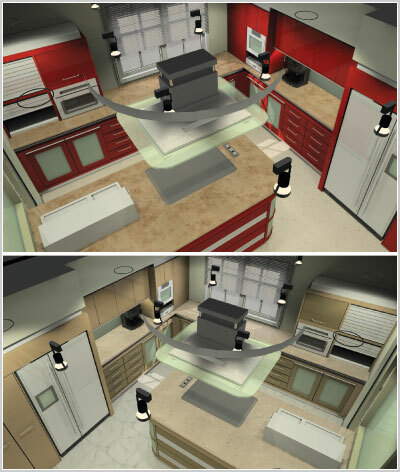 In the concept kitchen illustrated here, we separate the two functional areas through a separation screen, which allows the two areas to operate independently and also maintain overall spatial integrity. This creates a sense of space and abundance. The location of the three key equipment items – stove, fridge and sink – should be designed to not pose a conflict to one another. 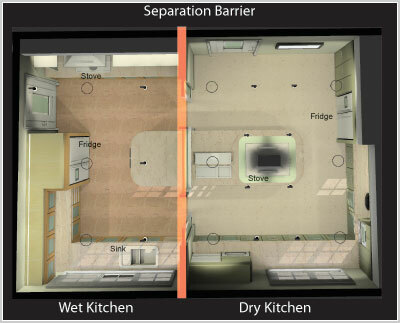 In the case of the wet kitchen, the stove and sink are placed in a way so they are not in a direct line with one another. Similarly, the fridge is located inside its own compartment to avoid a direct line with the stove. To integrate the wet and dry kitchens, a preparation stove in the dry kitchen is in line with the fridge from the wet kitchen. Here, a separation screen such as a sheet of frosted or decorative glass panel can be used to block direct view yet maintain translucency. This is meant to give a feeling of space. The materials you select can have a positive or adverse effect on the feng shui of your kitchen. To understand how materials affect the feng shui of your kitchen, look first at Flying Star combinations, then at the element properties of the different compass sectors. 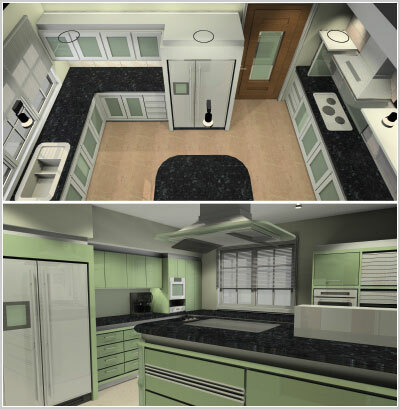 For instance in this kitchen concept design, both kitchens are located in the East and Southeast corners of the house. The wet kitchen is in the Southeast, occupied by the 2water and 5mountain flying star combination. The wet kitchen represents the element of fire because cooking takes place here; so fire placed here does not only strengthen the 5 and 2 earth stars that represents misfortune luck, but the fire also weaken the Southeast wood sector itself (8 Mansions). In this situation, we would need to control the fire energy and balance the elements. It is necessary to weaken the flying star combination. This can be done by introducing the metal element into the kitchen design and its finishes. Metal element is represented by the colors white and grey, or by using brushed stainless steel finishes to equipment and furniture, the metal energy will help control the 5, 2 earth flying stars. Introduce the element of water through the colors black, through the use of black tiles or black worktop tables for symbolic water energy. This controls the fire element of the stove, and simultaneously strengthens the wood element of the Southeast corner. The dry kitchen is located in the East corner with the 6,1 stars present. The dry kitchen is used as a preparation and communal gathering area, and here suitable colours and materials can produce a softer, more controlled environment. Use of water element features such as a black tabletop (again the same material carried through from the wet kitchen) can enhance the East wood corner thereby simulating growth luck, while also activating the #1 water star which brings wealth luck. 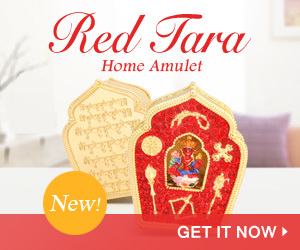 Here note that Red and Earth tones have been used to enhance fire (in the South) or earth (in the Southwest and Northeast) sectors. Fire energy can also be used to control the 3,4 and 4,3 flying star combinations. The idea then is to subdue the troublesome 3 with fire energy. In this example: Earth based colours such as browns and beige mixed with a selection of earth tone marble tabletops can help enhance the earth energy needed to activate kitchens that are located in Southwest and Northeast corners. Strong colour concepts must be balanced with neutral tones such as a white-based floor to avoid overwhelming the whole space. This selection of colours are beneficial for sectors that require earth and metal energy. 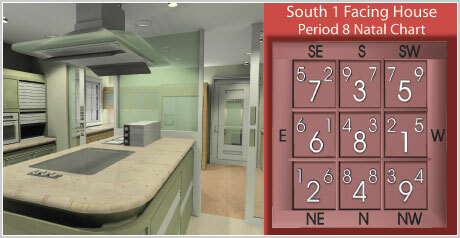 In designing your kitchen it is extremely beneficial to acknowledge two key feng shui factors. Firstly, the layout must not create any conflicts between the three key elements (fridge, sink and stove) and secondly, the colours and materials you choose should in some way benefit the luck of the compass sector where the kitchen resides.